Bread is a carbohydrate-rich food baked from a dough made from flour (typically wheat flour) mixed with a liquid, typically water or milk. Other ingredients may include a fat to keep the bread softer longer, yeast to cause the resultant dough to be lighter in texture, a sweetener to feed the yeast, and a salt, both to keep the yeast activity in check and to help the baked product last longer. The temperature at which the dough converts into “bread” is 95 C / 203 F. The baking may be done inside an oven, or an oven-like device such as a Dutch Oven or crock, or, on top of a flat surface such as a griddle. Bread can be used as a food item in itself, eaten out of hand, or as an ingredient in other dishes such as sandwiches, bread pudding, bread sauce, etc. Discussions of bread generally break down into categories of flat breads versus risen breads, and white bread versus whole grain (aka “brown”) breads. There is also another category of breads called “quick breads”; these are types of bread that are risen but with a leavener that acts faster than yeast. Wheat makes the best Bread because of its gluten which traps the gases from the yeast. The debate over whether brown bread or white is better is nothing new: the Greeks and the Romans debated this, too. Most preferred white bread, and judged the quality of the bread by its colour — white was decidedly better in general opinion. Italian Bread generally has no fat in it, so it dries out very quickly, in a day or two. That’s why you’ll find so many Italian soup recipes that call for a chunk of the Bread at the bottom of the bowl — it was a way of softening up the leftover Bread so it could be used up. Bread made in Tuscany is made without salt. Centuries ago, when the Popes ruled much of Italy, they imposed a very high tax on salt, so the bakers learned to make do without it. Crustless bread was introduced in the UK by the Hovis company in August 2005. It is designed to save parents the wastage of having to trim crusts off sandwiches before children will eat them. It is made from the same ingredients other bread, but is slowly cooked in a special tin and oven so that the outer layer of dough does not brown. It involves keeping the temperature of the surface of the bread as low as possible, to preventing it from colouring. When Bread is popped into an oven, the dough will rise even more in the first 7 or so minutes, producing a nice, rounded top. This is called “oven spring”. Bread dough converts into bread at 203 F / 95 C.
In the recipe section, there is a beautiful cornstarch glaze that gives a professional bakery finish to your Bread or rolls. Some archaeologists now believe that grains were being milled for Bread at least 22,000 years ago — 10,000 years before there is evidence of grains being cultivated in South East Asia, which occurred 12,000 years ago. This would mean that they gathered the grain from the wild. The find was made by a team led by Dr Dolores Piperno at the Ohalo II site on the Sea of Galilee in Israel and reported in Nature Magazine (May 2004, vol 430). Archaeologists found a flat stone with grains on it. The site was apparently abandoned in a hurry by its occupants. The team speculate that the Bread may have been baked in a hearth nearby that looks like an oven. Before leavening agents (such as yeast) were discovered, all Bread was like chapatis or tortillas. The Egyptians made leavened Bread. Loaves which were made in Egypt over 5,000 years ago, and left in tombs, are now on display in the British Museum. The Egyptians invented closed ovens to bake Bread in. Greek bakers dominated the Bread trade in Rome. They established a strict guild system for their craft in Rome, extending a tradition that dated back to 800 BC in Greece. Through the expansion of the Roman Empire, Greek baking traditions influenced a vast area of the world, especially Western Europe. In 168 BC, a Baker’s Guild — the “Collegium Pistorum” was formed in Rome. The bakers could only be freeman — unlike other trades in Rome which were dominated by slaves. The Guild had a representative in the Roman Senate. The Romans made different kinds of Bread to go with different foods — even an oyster Bread to be eaten specially with oysters. They made Bread from wheat mostly, but also specialty Breads from groats, rye, millet and acorns. Gourmands often debated which region of the Empire made the best Bread — Cyprus, Phoenicia, Lydia, Cappadocia, etc. They also made Bread with cheese in it — in case you think this is something new our supermarkets have come up with. There were public bakeries to which poorer people could bring their Bread to be baked, or buy Bread when they had the money. Rich Romans would only eat white Bread. Around 150 BC, Romans invented a mechanical mixer for Bread dough, powdered by horses or donkeys. In 40 BC, the Senate passed a law that Bread would be distributed to all adult male citizens. It didn’t always stay free, though. By 275 AD, the Emperor Aurelian had to pass laws fixing the maximum price and minimum size of a loaf of Bread, and Constantine had to do the same again in 330 AD. Wheat was already growing in Britain before the Romans arrived; it was growing there as early as 500 BC. The Brits, though, were grinding it by hand. The Romans introduced milling techniques such as watermills. On Sunday, 2 September 1666, between 1 and 2 am, The Great Fire of London started in the bakery of Thomas Farryner, the King’s baker, in Pudding Lane. The family escaped by jumping from the roof. Their maid, though, perished, as she was too afraid to jump, and so achieved her place in history, though unnamed, as the first to die in the Great Fire. Bread used to be round because it was just plopped in the oven, and went round. Baking pans could have been made of iron, but they would have been expensive. In the 1700s, the tin mines in Cornwall were mined in earnest again, for the first time since the Romans, and the tin was used to make affordable Bread tins. Bread baked in these Bread pans could be toasted and sliced more easily — just in time for the rise in popularity of the sandwich. In time, France assumed the leadership position in the craft of making Bread (as well as wine) formerly held by Greece. Bread-slicing machines were invented in 1912, and exhibited in America in 1928. The inventor, Otto Frederick Rohwedder, first tried holding the sliced loaves together with pins. By 1928, he had perfected his machine so that it would both slice and wrap Bread. Americans so loved pre-sliced Bread that within 5 years of the machine being demonstrated, 80% of all Bread being sold was sliced. They came up with the expression “the best thing since sliced Bread”. A bakery in Battle Creek, Michigan was the first to use Rohwedder’s machine commercially. The first wrapping used was paper. 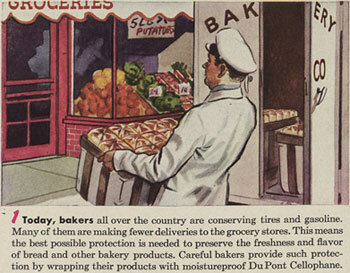 In 1927, the Dupont company had worked out a process to make moisture-proof cellophane. By the early 1930s, this new cellophane had almost entirely displaced paper wrapping on bread. In 1936, amber-coloured cellophane was developed by Rodney M. Stockton. The first customer was a rye bread bakery and today, amber cellophane continues to be widely used to “signal” brown breads to customers. Wonder Bread was the first mass-produced bread to be sold in slices, first appearing on store shelves in Britain in 1930. By 1933, 80% of all Bread sold in America was pre-sliced. Pre-sliced and wrapped loaves were prohibited in Britain during the Second World War, and weren’t allowed again until 1950. 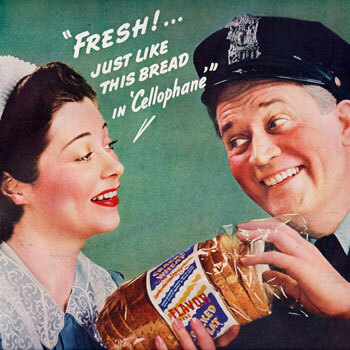 In contrast, in America, Dupont touted the use of cellophane bread wrapping as helping the war effort. Because it kept bread fresher longer, it meant that bakers had to make fewer deliveries to stores, and women had to make fewer shopping trips (both of which saved fuel and tires), and, it reduced wastage of bread that had gone stale. There was a belief amongst some people that fresh Bread was not good for you. Many were certainly told that by grandmothers, when bread and rolls hot out of the oven were resting on their racks in the kitchen. And, many have since suspected that in admonishing us, the women weren’t so much protecting our health as they were protecting the bread they had designated for dinner from the paws of children and men made ravenous by the smell. “… we were passionately fond of new Bread, which we were seldom or never allowed to have, as it was supposed not to be good for us.” — Samuel Butler, The Way of All Flesh. Chapter 3. 1903. The term “Upper Crust” comes from England. The bottom crust of the loaf would be covered in wood ash from the oven, as they were placed directly onto the oven floor, so the top half of the loaf was sliced off horizontally and sent upstairs to the gentry, and the bottom half left downstairs for the staff. A reputed Anglo-Saxon Bread Purity Law (aka “Hlafclaenness Dom”, passed by Edward the Confessor in 1047), was an Internet joke. The Greek word for broad bean flour was “puanos.” This was used in making Bread by the Greeks and Romans, hence the Roman word “pan” for Bread. Some French Bread flours, such as those prescribed by law for baguettes, still include about 2% broad bean flour. A Penny Loaf was a common size loaf of Bread in England set down by the Assize of Bread Act in 1226. The actual cost and weight of the Bread, however, would vary based on the flour that had been used. Wallop, Harry. Bread rules abandoned after 750 years. London: Daily Telegraph. 25 September 2008. ‘Bredstreete warde’, A Survey of London, by John Stow: Reprinted from the text of 1603 (1908), pp. 344-352. Derbyshire, David. Can the crustless loaf persuade children to eat their sandwiches? Daily Telegraph: London. 9 August 2005.